We will meet at The Patriot Place, Foxboro, MA in the parking lot beside the movie theaters ( Lot #4 is on the posts in the parking area). We will be arriving at Garden in the Woods via some very nice roads between Foxboro and Marlboro. The Garden opens at 10:00AM. Once there you will be able to walk the beautiful gardens for 3 hours. 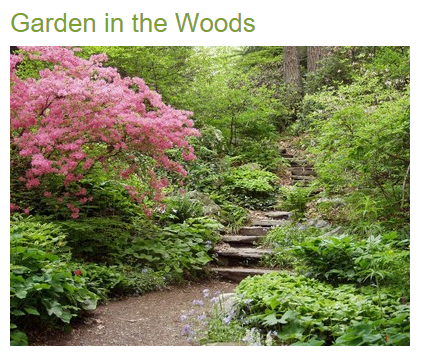 There is a cost to enter the gardens: Seniors 65+ $9.00, all others $12. Once we have finished with the Gardens we will have a short drive to Fireflies BBQ in Marlboro.